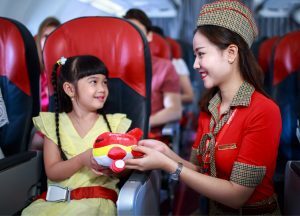 Vietjet celebrates the festive season from now till 15 February 2019 with its biggest program of the year titled “Love connection – Love is real touch”. As part of the program, hundreds of free tickets and attractive activities are up for grabs! 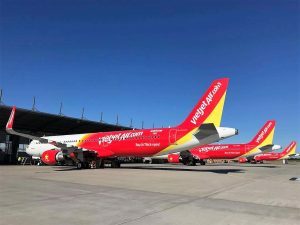 “Love connection – Love is real touch” incorporates Asian countries and territories in Vietjet’s network, including Vietnam, Japan, South Korea, Taiwan, Thailand, Singapore, Malaysia, Cambodia and China. What this means is that participants throughout Asia can join this exciting journey by sharing their love stories and expressingtheir desires and wishes to travel to one or more destinations. Stories should be in the form of an article of up to 1,000 words, accompanied by at least one picture. The love connection journey is specially designed for those who are passionate abouttravel and those interested in exploring and experiencing nature, culture and society. The entry stories could be wonderful memories of travelling, sightseeing and experiencing culture or people. They could also be about a dream of travelling to countries never visited before. The winners of “Love connection – Love is real touch” will be awarded with special flights to Asian destinations, connecting them with their loved one. • For families, Love connection is the chance for people around Asia to reunite with their families, such as students abroad, relatives, friends and etc. • For millennials, Love connection is the chance to reach new destinations or re-visit their favorite locations and it is also a great opportunity to explore and inspire the tourism trend of “living a local life”, keeping life balance. • For travelers, Love connection is the chance to enrich life experiences as well as to realize their travel dreams. As part of the campaign, Vietjet has commissioned six uniqueworks of art at several airports and on its aircrafts, which bear bold and distinguished Asian culture identity.